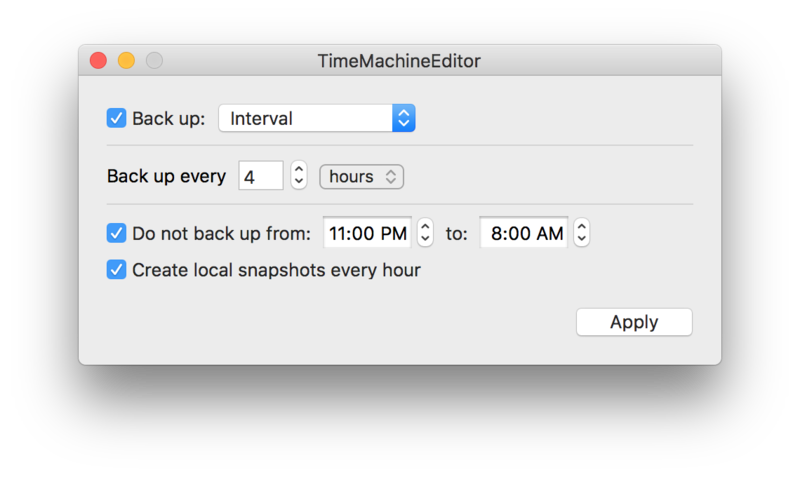 TimeMachineEditor is a software for macOS that lets you change the default one-hour backup interval of Time Machine. You can change the interval or create a more sophisticated scheduling (see screenshots below). The tmectl(1) command line tool allows to print and modify settings, enable/disable the scheduler and uninstall the application. Just fire up the command without any argument to see its usage. 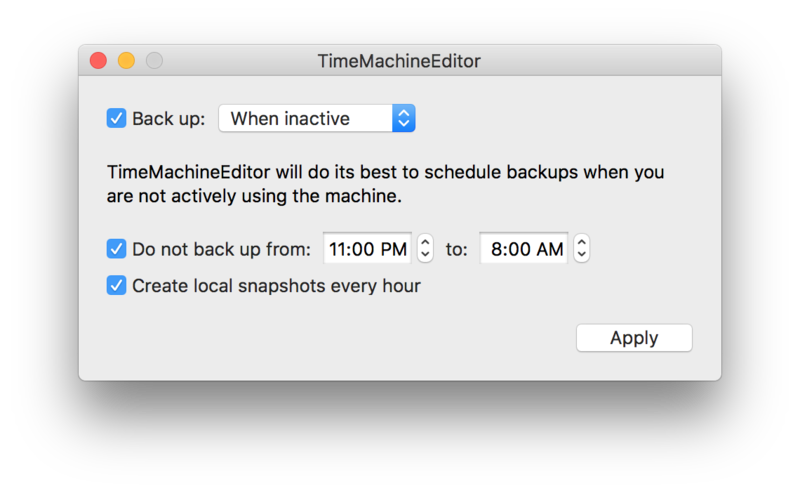 Should I disable automatic backups in System Preferences > Time Machine? Yes. TimeMachineEditor will also do that automatically for you. 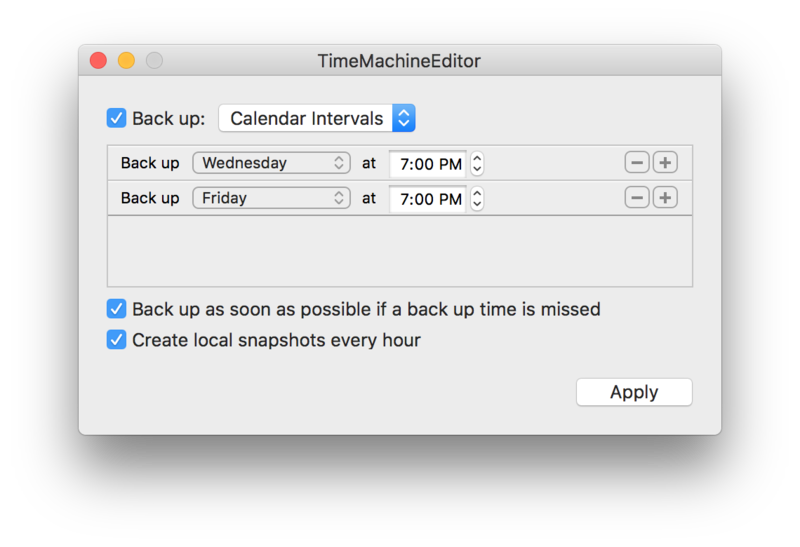 Doing this disables the default one-hour scheduler which is what you want since you will now be using TimeMachineEditor to schedule the backups. Do I need to keep the application running or launch it at login time? No. You just need to use the application when you want to change the settings. Will it back up while the machine is sleeping? TimeMachineEditor supports Power Nap which you can enable in System Preferences > Energy Saver. If you are using a laptop computer, make sure you are on the “Power Adapter” tab, as this feature only works when connected to AC power. How does TimeMachineEditor preserve/discard backups? TimeMachineEditor does not change that, it is handled by Time Machine. Time Machine will coalesce and discard backups as described in System Preferences > Time Machine. How do I uninstall TimeMachineEditor? Just select the “Uninstall...” command located under the application main menu. Alternatively the tmectl(1) command line tool can be used with the “uninstall” argument. TimeMachineEditor is totally free to use. Donations contribute to the web hosting and developer account fees. You can contact me by email at timemachineeditor@tclementdev.com.